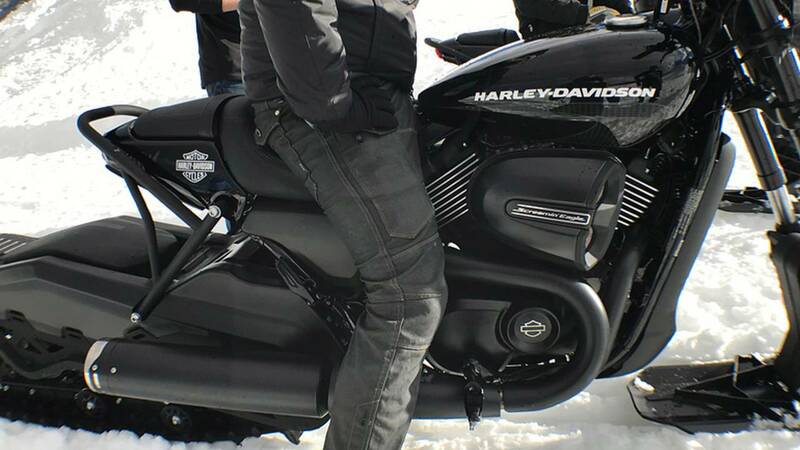 Harley-Davidson and Suicide Machine Company built a pair of extremely rad Street Rod-based snow bikes for the X Games. What do you get when you cross a Street Rod 750, a snow track kit, and the know-how of a couple of ace fabricators? Well, you get a pair of killer Street Rod-based snow bikes like these two beauties right here. Now, I hear you. I hear you asking, "But Jason, why?" 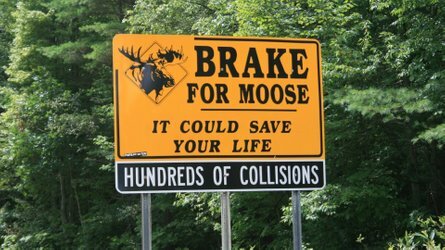 The short answer is, "Why not?" The long answer is that the X-Games are coming up and Harley wants to go play in the snow with the cool kids. 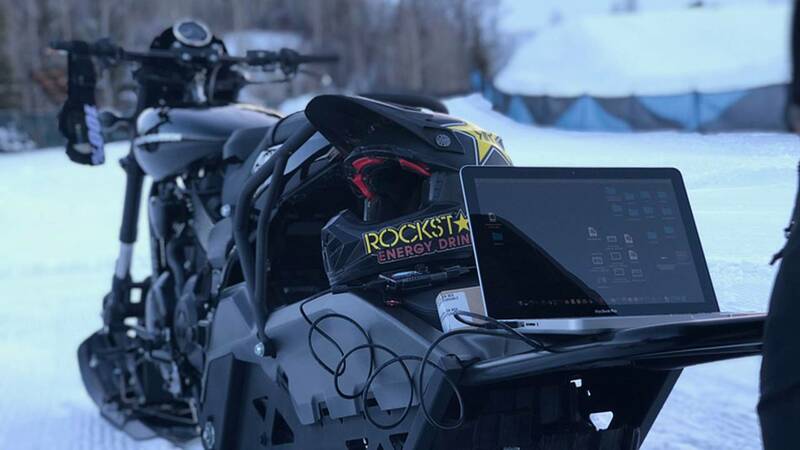 A week or so ago, we told you about Harley's new Snow Hill Climb event at the 2018 X Games out in Aspen, CO. 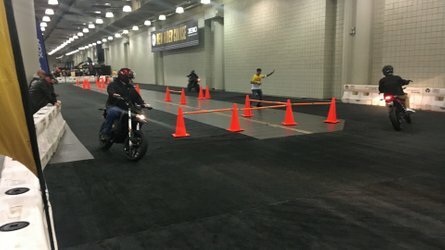 Apparently that wasn't the only thing The Motor Company had up its sleeve for the event, as I found out earlier this week when I got to talk with Scott Beck, Harley-Davidson's director of marketing. 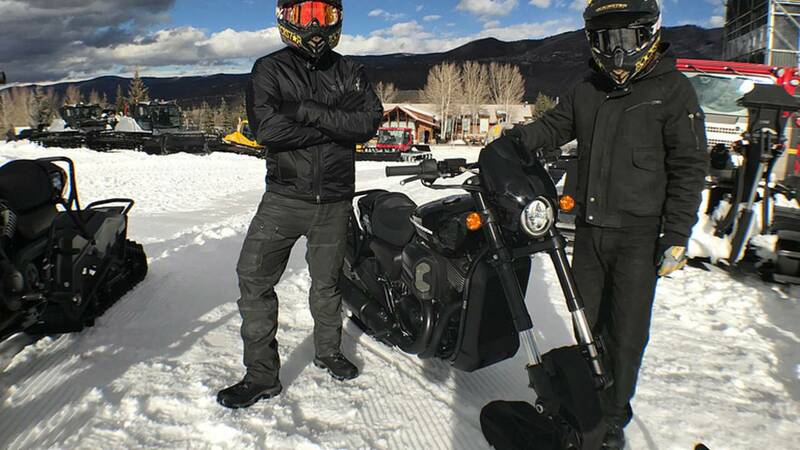 Along with the customized Sportsters taking part in the hill climb, Harley hired known hooligans and all-around cool guys Aaron and Shaun Guardado from Suicide Machine Company to build the Street Rod Snow Bikes to haul athletes around between events. That's... that's pretty rad, Harley. One of the first things I asked Beck was, "Why the X Games?" 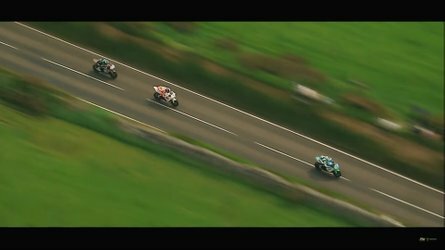 I'll be honest, when I think Harleys I think more about lonesome highways and open roads rather than, say, snowboarding and energy drinks. Beck told me that the hill climb event and the snow bikes are all part of Harley's efforts to attract more people to motorcycling via the power of awesomeness. That's great and all, but what you guys really want to know about is the bikes themselves, right? Lucky for you I also talked to Aaron Guardado of Suicide Machine about the build to find out how these things were built and what makes them tick. The bikes started off as bone stock XG750 Street Rods, which the brothers received from Harley just before Christmas. That kicked off a frantic search for track conversion kits, a search complicated by the fact that these things are so popular that they're sold out just about everywhere and Christmas was in a few days. After a flurry of phone calls, they finally tracked down two Camso DTS-129 kits at a dealership in Salt Lake City, Utah, on December 23. The track conversion kits arrived at Suicide Machine's Long Beach shop on Christmas Eve, delivered by the SLC dealer himself in his wife's Jeep, but that was just the beginning. If you don't know – and I didn't know until Aaron told me – track conversion kits like the Camso units are built specifically for dirt bikes, not street bikes. This meant that both the bike and the track unit itself would have to be modified to make the project work. The guys started by removing the Street Rods' swingarm, rear tire, and shocks. They then fabricated a pair of struts with quick-release hardware to connect the track unit to the bikes themselves. This was complicated by the fact that the track unit was just a hair narrower than the bike, which threw off the chain allignment. With the help of a machinist friend, the Guardados built a handful of spacers and other adapters to get the drive chain aligned with the bike's primary drive. Thankfully, since the track has its own integral suspension, they didn't have to deal with finding a way to spring it as well as mount it. Up front, they removed the front wheel and fender to mount the conversion kit's ski. 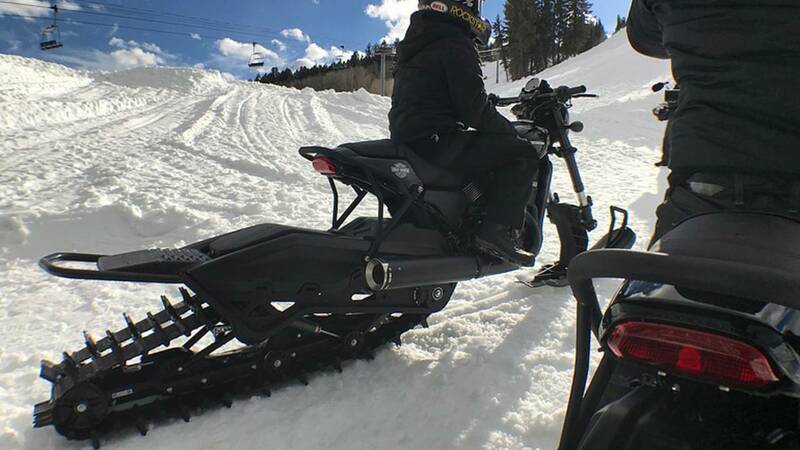 Using the stock Street Rod axle, forks, and triple trees and some custom machined spacers, they were able to mount the ski with much less drama than the track. It still wasn't quite right though. See, the skis only come in white, which just wasn't going to cut it. Since, as we all know, black is the coolest color, the guys had the skis ceracoated black. This improved not only their aesthetics, but added an additional layer of protection to keep the skis safe from any debris or obstacles lurking in the snow. On the performance side, the Guardados chose to give the bikes a light tune and fancy-pants new clutches. Each one got a Screamin' Eagle pro street tuner, Screamin' Eagle intake, and Screamin' Eagle exhaust. The latter needed a bit of fiddling to get it to fit since the stock mounts were removed when the track was installed. To improve power delivery and make these frankenbikes easier to manage, the brothers switched out the stock clutches for Radius X auto-clutches from Rekluse. 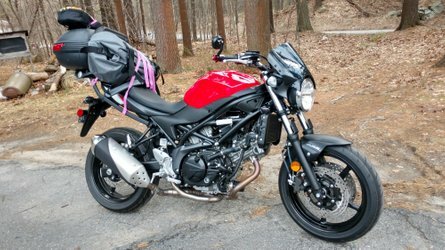 These things consist of an auto-clutch assembly and a custom clutch pack and allow a rider to start, stop, and shift without ever touching the clutch lever. Aaron told me that the Rekluse clutches make the Street Rods respond to throttle input more like something with a CV transmission than a standard gearbox, therefore making them easier to control in the snow. Once all the machining and fiddling and finessing was done, it was time for the Guardados to test their new creations. Sadly, there was no snow because, you know, California, so the bikes were just fired up on the bench and tested in the shop. Everything looked okay, so the bikes were loaded up and shipped out to Aspen for their shakedowns. Once the bikes were in the snow, they really showed off their potential. The Street Rods proved surprisingly well suited for the snow bike conversion, and with the engine tune and Rekluse clutch they powered through the drifts like they were built for it. At one point during all the screwing around in the snow serious testing, Olympic snowboarder Ben Ferguson showed up with fellow snowboarder Jack Mitrani. After oohing and aahing over the bikes for a bit, they snagged one and started towing each other through the snow while kicking up serious rooster tails. This was, without a doubt, the perfect way to test them. During our conversation, Aaron told me that despite the stresses of building these bikes over the holidays with such a tight deadline, that he was really proud of how they came out. He felt that the project stretched the boundaries of not just the brothers' skills as builders and fabricators, but the capabilities of the Street Rod as well. 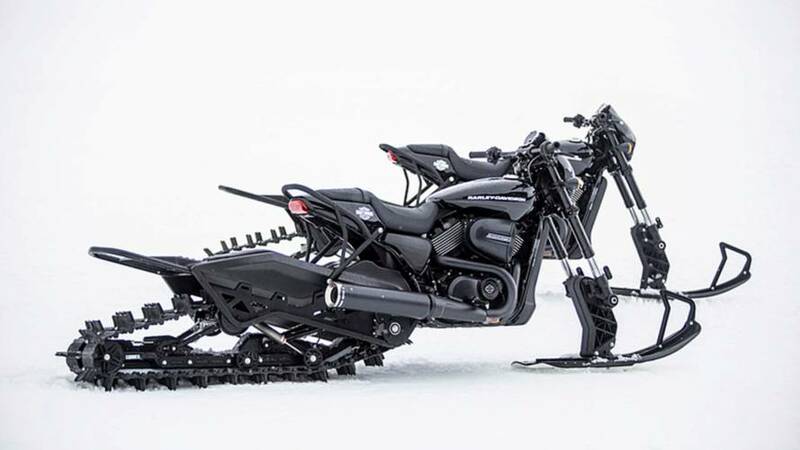 I gotta say, these snow bikes are extremely rad. They're such a departure from the usual Harley-based customs, and they really show off the versatility of the Street Rod platform. I mean, who ever would have thought making a Street Rod into a snow bike? 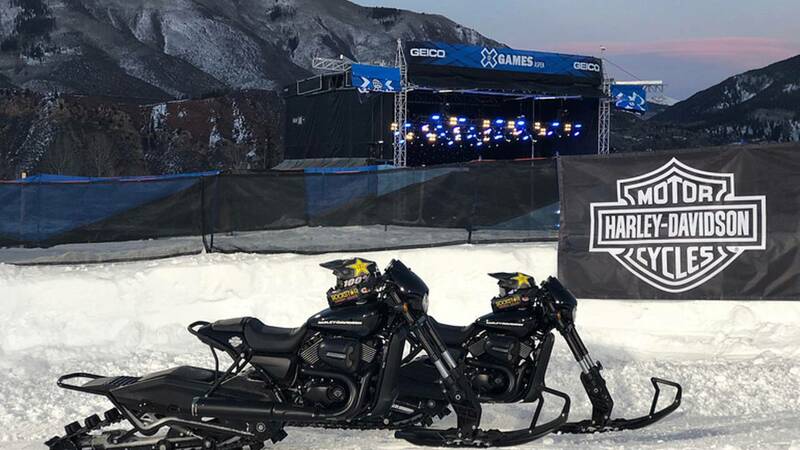 If you're going to be in Aspen this weekend, or are just enjoying the X Games from the comfort of your warm living room, keep an eye out for them zipping around the event grounds.